David Parker, owner of ER Plumber Services of Charlotte, is giving Jeff Reynolds a new tankless water heater through the summer 2013 tankless water heater sweepstakes. We're a company that believes in giving back to the loyal customer base that has supported us for so long. David Parker, owner of ER Plumbing Services of Charlotte NC, has awarded a new tankless water heater to Jeff Reynolds through the summer 2013 tankless water heater sweepstakes. Says Parker, "We're a company that believes in giving back to the loyal customer base that has supported us for so long." ER Plumbing Services has been serving the Charlotte area for almost two decades now, providing residential and commercial emergency plumbing services. 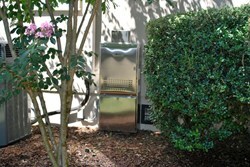 They also install water heaters, gas logs and whole house water filters. "It's not the first time we've given away a big prize," Parker says. "We've given away an iPad, a whole house water filtration system and another tankless water heater. Why? Because we've grown and flourished thanks to the dedication and support of this great community, and we want to give back in any way we can." Parker recognizes the fact that people are still recovering from the recession. "It hasn't been an easy time for any of us, and we're happy to give folks a leg up wherever we can." Parker prides himself on his positive, altruistic company culture. He and his employees have participated in community service projects that benefit the underprivileged, even winning the prestigious "9 Who Care" community service award from Channel 9 of Charlotte. To learn more about ER Plumbing Services and their commitment to the community, visit the website at http://www.erplumbing.com or check out their blog to hear about upcoming contests, tips and events.